As published in LinkedIn Influencers on January 19th, 2017. In the hours following November’s election, a Facebook event was created for a rally in Washington, DC. The date? January 21st. The day after the inauguration of Donald Trump as the 45th President of the United States of America. Within hours, similar event pages had been created and thousands had indicated that they would be going. By Day 1, many of these pages had been merged, and the Women’s March on Washington went from being an idea to reality. By Day 2, leaders from diverse backgrounds were brought in to ensure that as wide a range of voices as possible would be heard. Within a month, over 100 organizations had lent their support and resources to the organization of the event. And on January 12th, organizers released their official policy program, which outlined an aggressively progressive proposal that was lauded for its unapologetic stance on many of this nation’s most pressing and crucial political and social issues. It is estimated that up to 250,000 people will attend the march in Washington, with sister marches planned in all 50 states. Potentially millions more will march in over 150 cities in 60 countries across all six continents worldwide. It will be the largest demonstration on the first day of a new administration in the history of the United States, and it all started with a simple Facebook event group. It will likely be generations before the full ramifications of technology’s swift and massive influence over so many aspects of our lives will be fully understood, and while there has been much hand wringing over the relentless pace of technological advancements, I myself can only marvel at the resources that we now have at our fingertips. With just a few clicks or taps, an idea can go viral and a movement can be born, and although movement building is nothing new, the sheer scope and speed at which people can come together due to today’s communication tools is staggering to behold. Not only are people coming together, but they are sharing ideas, perspectives, and stories, and when criticisms are raised, people are listening and engaging. In its earliest incarnation, the Women’s March on Washington was quite rightly criticized for its all white leadership and for appropriating the name Million Women March from the historic 1997 march in Philadelphia. Organizers moved quickly to correct these early errors, bringing in respected leaders from diverse backgrounds and renaming the event. Today, on the eve of the march, it promises to be one of the most inclusive and diverse rallies in the history of this country, and it has come together in just a fraction of the time an event of this scope would normally need. That’s the power of technology, and its potential for the future is truly inspiring. The Women’s March on Washington promises to be a historic event, and while I hope you will all come out and join us on January 21st, my bigger hope is that this Saturday is merely the beginning of a new age of positive and peaceful activism. If one Facebook event page can lead to an event of this size, imagine what we can accomplish going forward. 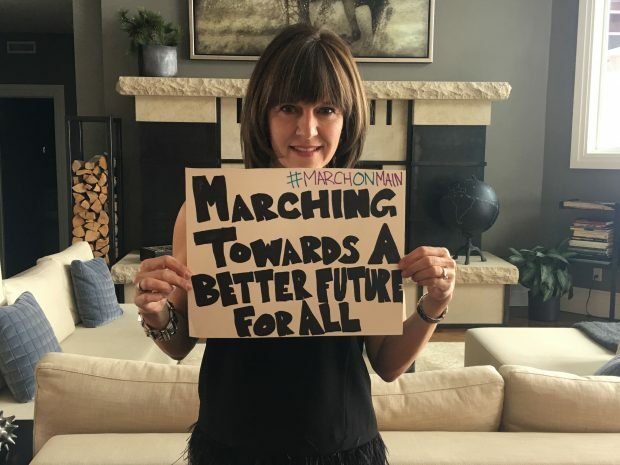 I have made it my life’s work to advocate on behalf of women and girls around the world for gender parity, so I will be proudly marching this Saturday in Park City (#marchonmain) alongside my incredible daughter and many dear friends for many causes that I hold dear. Organizers have repeatedly stressed that this rally should not be seen as anti-Trump, but rather an event for all defenders of human rights, so regardless of where you fall on the political spectrum, I hope you will join us, either in Washington, or across the US and the world at large. As the policy platform of the march states, we are all in this together. The Women’s March on Washington is a women-led movement bringing together people of all genders, ages, races, cultures, political affiliations and backgrounds in our nation’s capital on January 21, 2017, to affirm our shared humanity and pronounce our bold message of resistance and self-determination. Previous Post 2017. The Year of Wonder Women.